Like many other teachers, I'm on February break from school this week, so when I woke up this morning to a blanket of snow the first thing I thought of was breakfast instead of possible school cancellations. 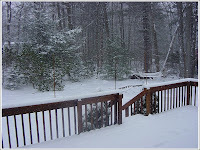 I came downstairs and put on the TV to see what the weather situation was going to be for the rest of the day, but I never made it to the local news, no big deal there (as Bob Dylan says, "You don't need a weatherman to know which way the wind blows", or in this case, the snow). I got stuck on channel 185, which is Create on my cable system, and an episode of Lidia's Italy. I caught it in the middle, but just in time to see Lidia throw some onions and bacon into a large saute pan with some oil which eventually turned out to be a potato side dish for the feature recipe of the show, Italian goulash. The goulash looked amazing, but at 7:00 this morning it was the potatoes that stuck with me. Instead of leaving the potatoes in chunks, Lidia smashed them up and then cooked them over high enough heat to get good caramelization on the bottom of the potatoes. Then she stirred them up and repeated the process. The resulting potatoes were nicely brown all over, but somewhat smashed like extremely lumpy mashed potatoes. A nice hearty breakfast is a wonderful thing on a cold, snowy morning and in my opinion, breakfast is elevated to another level by the presence of some form of potatoes, be they home fries, hash browns or whatever. The fact that potatoes take just a bit longer to prepare, so you can't really make them unless you have some extra time in the morning allows them to retain their special quality. Lidia was all the inspiration I needed this morning, as my mind was now set on potatoes and a slightly more "special" breakfast than usual. I went into the kitchen and heated a bit of oil in a saute pan, chopped half an onion and threw it in the oil with a few drops of liquid smoke. My wife doesn't eat pork, so I often use a few drops of liquid smoke (very few drops because the stuff is potent), some butter, and some salt as a substitute for bacon in most recipes that call for it. It's not the same, but it works pretty well. Anyway, when the onion had softened a bit, I added one russet potato that was peeled, chopped, and sliced into pieces about 1/4 to 1/2 inch thick. I let this sit untouched for about 4 minutes, then stirred it up a bit. I also added a little bit more oil (about 1 teaspoon) and a pinch of salt. After about 8 minutes, the potatoes had softened a bit and I smashed them up with a fork. I added another teaspoon of oil, another pinch of salt and continued to cook them for about 8 more minutes (repeating the stirring, oiling, and salting, after 4 more minutes). When the potatoes were done, I moved them to another burner on low to keep them warm, and got going with the rest of breakfast. My wife requested an omelet (which she pretty much always does when she knows I have time to make breakfast) and I went with my standard Friday morning egg sandwich. I had baked some bagels yesterday morning, which made for an excellent sandwich, if I do say so myself. The potatoes didn't look quite like what Lidia had produced, but they were an excellent compliment to the breakfast. If you like your potatoes and onions at the absolute limits of caramelization, just sort of burned (like I do), then this is a recipe for you. If you like a bit more flavor, some garlic powder, paprika, chili powder, or really any spice that you like will definitely work here. Stir the potatoes, if they look a little dry, add another teaspoon of oil, another pinch of salt, and let them sit untouched for 4 minutes. Smash the potatoes with a fork. Continue to cook for about 8 more minutes (make sure you let the potatoes cook in undisturbed 4 minute intervals to get nice caramelization on the bottom) adding additional oil if the potatoes look too dry or the onions seem like they are going to burn. Last night I made Braised Greens Tacos for dinner and they were awesome. Totally different than any taco I'd ever had, almost certainly healthier. 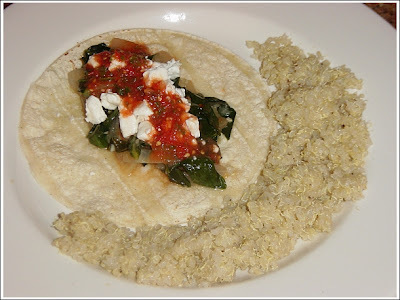 Braised collard greens and onions on a corn tortilla, topped with crumbled goat cheese, and a fresh salsa made from pureed cherry tomatoes and jalapenos - brightly flavored and delicious. I couldn't find chipotles in adobo, so I used a fresh jalapeno pepper that I halved, seeded and tossed in the pan with the tomatoes. I added a little ketchup, cider vinegar, salt, cumin, garlic powder to simulate adobo sauce. I served it all with some lightly buttered quinoa. Give them a try. That taco looks fabulous! Great combo idea.